This is the first in a series of blogs exploring how religious communities who are Standing with Standing Rock are reviewing their investments for ties to the Dakota Access Pipeline. Will their investments change? The Evangelical Lutheran Church in America (ELCA) has taken a formal position supporting the Standing Rock Nation and its opposition to the Dakota Access Pipeline (DAPL). It also is flexing its financial muscle, looking at how its investments are supporting DAPL and asking tough questions of Enbridge, a major DAPL investor. There is a growing effort to get individuals and institutions to divest from companies tied to DAPL. Divesting is one option outside of the political arena where people can make a difference and vote their values with their money. The ELCA is a large institutional investor, socking away money for retirement plans for its many employees. It’s the kind of big investor that can influence a corporation. As of the third quarter of 2016, the ELCA had $7.8 billion managed by Portico Benefit Services. (Of that, $6.4 billion was in retirement plans). Portico just this week, along with several other investors, submitted a shareholder resolution to Enbridge Inc. [regarding DAPL] … This resolution calls on Enbridge to prepare a report to shareholders detailing the due diligence process used by Enbridge, its affiliates, and subsidiaries to identify and address social and environmental risks, including Indigenous rights risks, when reviewing potential acquisitions. A second Norwegian bank has pulled its funding from the Dakota Access Pipeline (DAPL), according to a Nov. 25 story in EcoWatch. Odin Fund Management, one of Norway’s leading fund managers, said it sold $23.8 million worth of shares in companies involved with the pipeline. We blogged earlier that DNB, Norway’s largest bank, had decided to divest its assets from DAPL (though it still has a line of credit to the project). Norway is an ocean and a half-continent away from Standing Rock. Is it that Norway is simply a more socially-minded country? Perhaps. But there also is a fascinating backstory that could be part of the explanation. 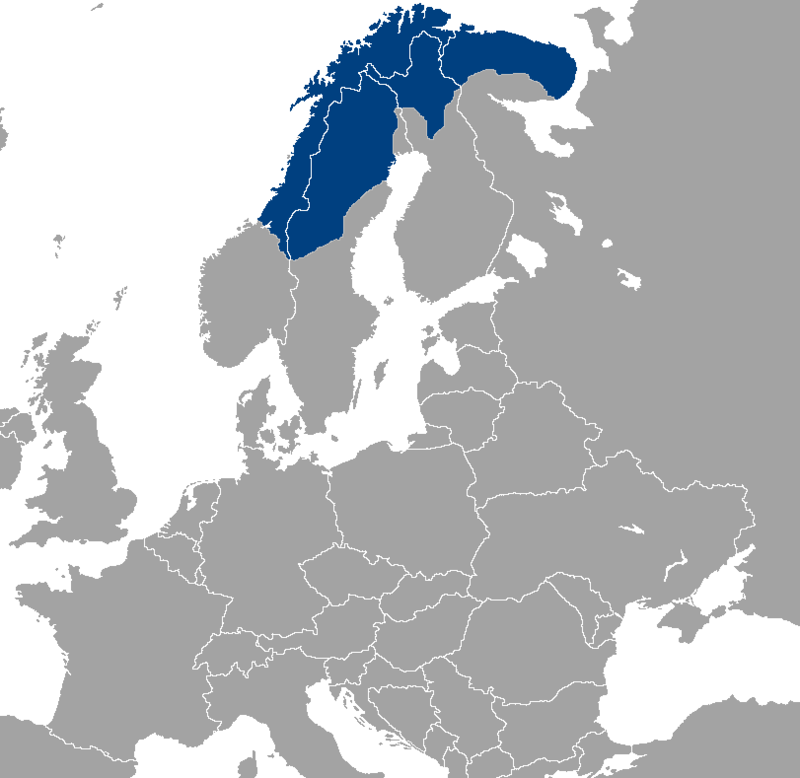 The Sámi people, indigenous people of northern Europe, seem to have played an important role in pressuring DNB to divest. We have a backlog of updates to report on Standing Rock and the Dakota Access Pipeline (DAPL). (The blog didn’t get much attention the past few days as Healing Minnesota Stories was participating in an incredibly powerful three-day Bearing Witness Retreat, an interfaith event organized by Clouds in Water Zen Center. It witnessed to Minnesota’s participation in the Native American genocide. The rally against the Dakota Access Pipeline started in Mears Park in Downtown St. Paul. Hundreds of people opposed to the Dakota Access Pipeline gathered today in downtown St. Paul to ask President Obama to stop the project altogether. 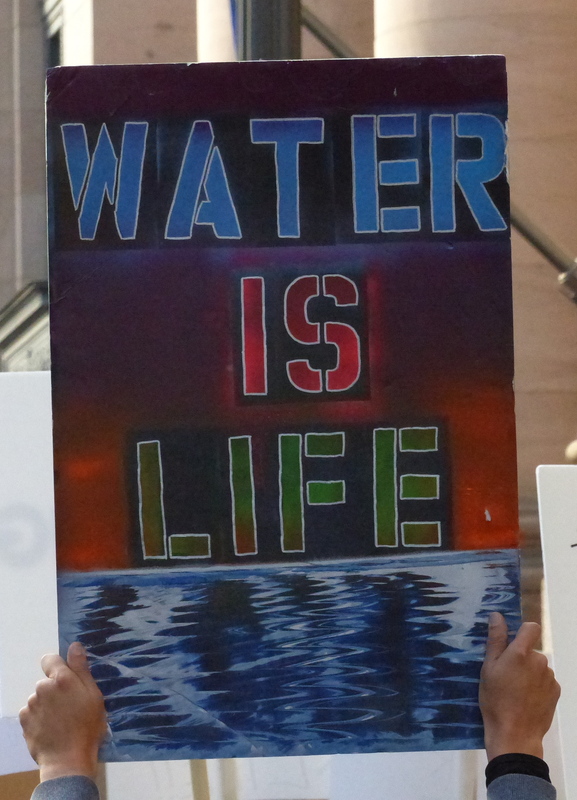 They carried colorful homemade signs and chanted in a call-and-response,”Mni Wiconi … Water is Life!” The rally started in Mears Park and participants then marched to the nearby local headquarters of the U.S. Army Corps of Engineers — an agency that holds a key to the pipeline. This was part of a National Day of Action against the pipeline, sponsored by indigenous and environmental groups. Locally, the sponsors ranged from the Indigenous Environmental Network (IEN) and Honor the Earth to the Sierra Club and Friends of the Earth. According to an MPR story, this was one of 300 rallies held across the country, including 10 others in Minnesota. 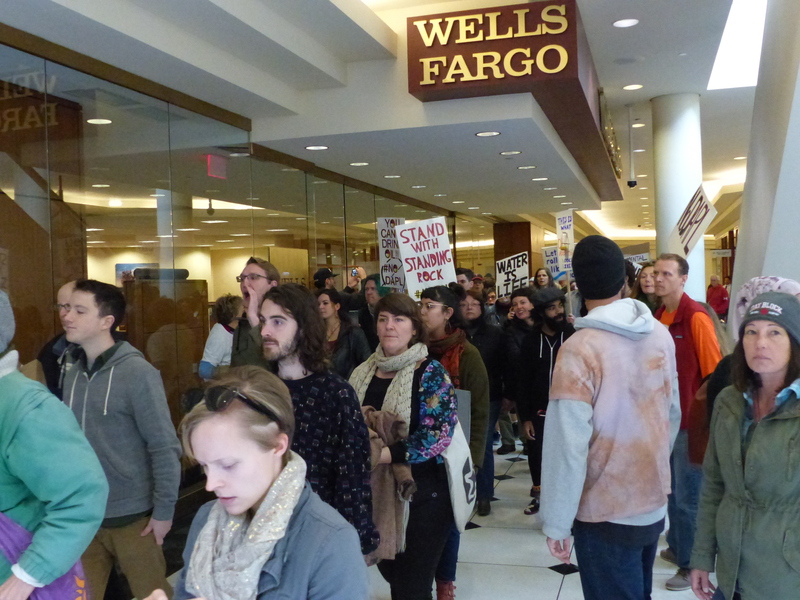 Some rally-goers continued to Wells Fargo. Public pressure on banks funding the Dakota Access Pipeline appears to be paying off.